His birthplace and the place of his episcopate are unknown. He was a monk of the Studion monastery in Constantinople, and a disciple of St Theodore the Studite. As a bishop he was severely persecuted by the iconoclasts in the time of the Emperor Constantine Copronymus, enduring hunger, imprisonment and mocking, thus earning the title "Confessor." 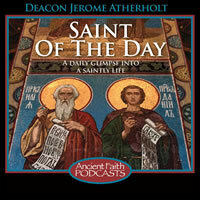 Saint Theodore wrote a homily in honor of him.